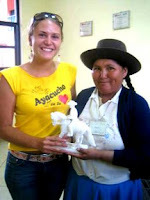 FINCA Peru Exports (FPX) is an interesting hybrid: It's a division of FINCA Peru, a pioneer in Microfinance for more than 10 years, and links microentrepreneurs producing handicrafts with Fair Trade distributors in Europe and North America. FPX has been established and run by young volunteers. Being part for a couple of months last year was a truly amazing and inspiring experience! Recently FPX published their two new catalogues with beautiful designs of handmade clothing, accessories, textiles and home goods from Peru. By buying from FPX you can directly help disprivileged women and families. Have a look at their two new catalogues. Furthermore, you can have a look at an 18-minute video about the organization we produced while I was there (in Spanish, sorry for small English subtitles). I am also featured in there ;) Watch the FPX video on YouTube.